This is such a great home! 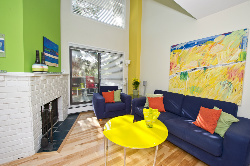 Very cool and funky colors in this two storey condo that shows more like a townhouse than an apartment style condo. The patio is spacious yet private and provides incredibly easy access for you to take the puppy for a stroll up and down 17th Avenue during the summer evenings.